A rare jewel in Nova Scotia, Digby Pines Golf Resort and Spa overlooks the stunning Bay of Fundy as well as the colorful Annapolis Valley. Presenting excellent and comfortable accommodations in a secluded setting, the resort is a quiet, tranquil retreat from the hustle and bustle of city life and open to guests throughout the summer months. The invigorating coastal air, excellent dining, and the dedicated staff create an atmosphere of warm hospitality which will exceed all expectations. Digby Pines Golf Resort and Spa is open seasonally, and typically welcomes guests each year beginning in mid-May and closes in mid-October. 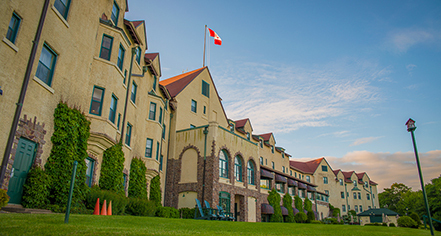 Digby Pines Golf Resort and Spa, a charter member of Historic Hotels Worldwide since 2014, dates back to 1905. In 1965, the Nova Scotia Provincial Government bought the hotel from the Canadian Pacific Railway Company and renamed it “The Pines Resort." Cancellation Policy: Hotel has a cancellation policy of 72 hours prior to arrival. A first night’s fee will be collected if a cancellation occurs in less than 72 hours prior to arrival. Cribs and Pack-in-Plays: Available upon request; $10 CAD surcharge. Early Check-In/Late Check-Out: Available, depending upon availability, rates apply. Parking: On-site parking: Available. Self-parking: available RV, Bus, Truck parking. Pet Policy: Service animals allowed: Yes. Pets allowed: Yes. Dogs only. Fee: $25 CAD per night for the first pet, add $5 for each additional. Amenities: Dog walking map, Treats. Services: Dog sitting. Rollaways: Available upon request; $10 CAD surcharge. Shuttle Service: On-property and local transportation shuttle may be scheduled through the resort's concierge. Rates apply. A rare jewel in Nova Scotia, Digby Pines Golf Resort and Spa overlooks the stunning Bay of Fundy as well as the colorful Annapolis Valley. Presenting excellent and comfortable accommodations in a secluded setting, the resort is a quiet, tranquil retreat from the hustle and bustle of city life and open to guests throughout the summer months. 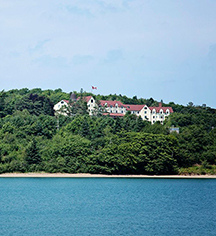 Learn more about the History of Digby Pines Golf Resort and Spa .